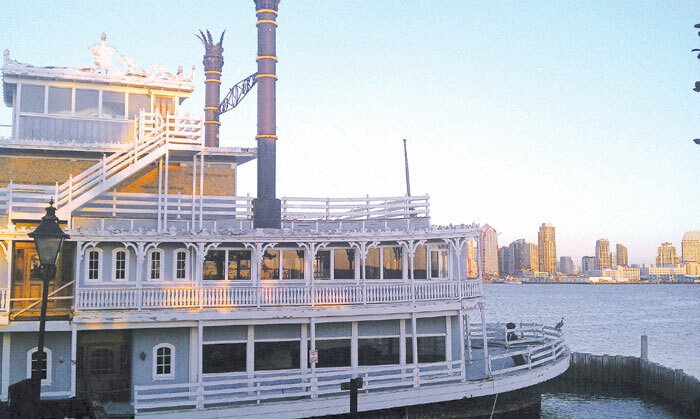 SAN DIEGO — Once an icon at the east end of Harbor Island, the 120-foot paddlewheel steamboat replica Reuben E. Lee has partially sunk while under repair at a San Diego Bay boatyard. The ship, which was actually a barge built in the likeness of a turn-of-the-century paddlewheeler, was found half-sunk at R.E. Staite Engineering’s boatyard, where it had been undergoing repairs since April. Originally constructed in 1969, the restaurant aboard Reuben E. Lee was shut down in 2003 after the barge was deemed structurally unsafe. Since then, property leaseholder Sunroad Enterprises has been working to revamp the restaurant, crafting a plan approved by the San Diego Board of Port Commissioners in 2008 to turn the restaurant into an open-air outdoor events area while building a restaurant adjacent to the barge, on land. Currently, Reuben E. Lee sits listing at R.E. Staite’s docks, with the aft section of the barge sitting on the bottom of the bay. The forward section is still floating above water. A boom was deployed around the partially sunk ship to contain any onboard contaminants and prevent them from polluting the bay. The Coast Guard reported no oil was leaking from the ship into the bay, and Story said the ship went through a hazardous materials cleaning in 2011 that removed all lead-based paint around the windows seals. Whether or not the barge is salvageable remains to be seen. The exact cause for the vessel sinking was not known as press time. Moving forward, Story said Sunroad Enterprises would still like to have some sort of outdoor floating platform at the old berthing spot of Reuben E. Lee, but the current state of the vessel will force the company to reassess its plans.